Recently, I’ve met really interesting competition by @mixonline called 10K Appart. Due to the rules, you have to create an application total size of which should not be more than 10K zipped content. Moreover, it have to be pure client-side application, utilizing HTML5/CSS3 features for responsible design and open API for gathering data. No frameworks, no 3rd parties. I decided to participate. I did it a style of weekend project, started up Friday evening, I’ve spend 3 hours to complete github API adapter and application logic. As always, hard part was - design. With much help of Sasha we have designed badges part of application. I still not 100% happy, but at least it was quite fast. After application were more or less ready, I put it on temporary hosting asking my dear twitter help me to validate it. I received a lot of great feedback (thanks a lot, guys). After all bugs were fixed, I posted my entry to 10K appart. I’ve been waiting about 4 days, to receive an answer. Meanwhile, I’ve seen that new application are being posted.. but not mine. Finally, they responded to me saying “Sorry, but Google Web Fonts are not allowed”. That was actually my bad, but I haven’t thought that are treated as 3rd party. Anyway, I had to switch to TypeKit very fast. I didn’t get same results as with Web Fonts, but I had no time for finding perfect match and reapplied again. I would be happy if you try it, tweet it, comment on site. 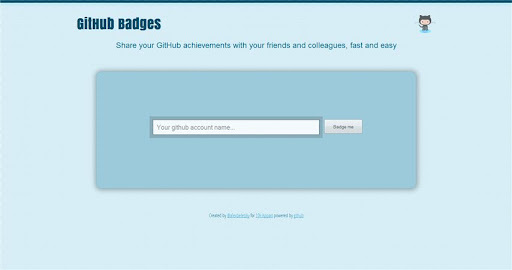 Sources are placed on github, so If you think to improve design or create new type of badge, you are welcome!